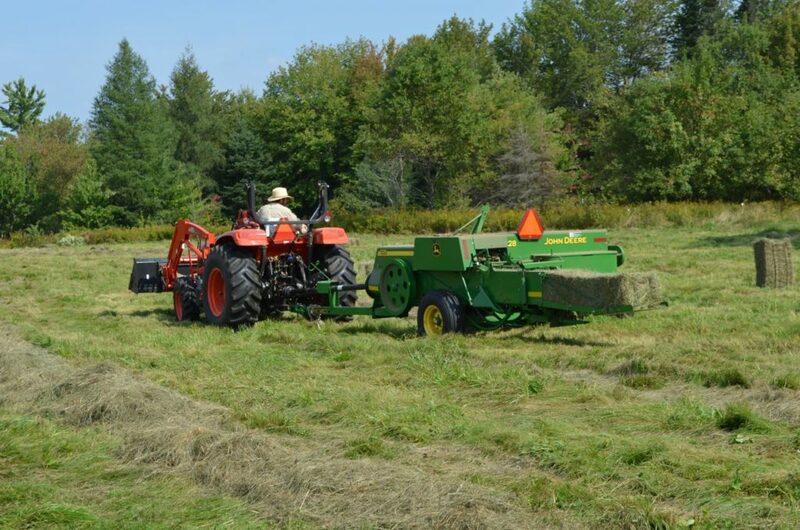 Our first cutting of hay was over the July 4th holiday weekend, so we don’t know what it is that turns these “holidays” into “haydays.” Alayne and I have now put up 910 bales total for the summer (a bale counter on the baler makes it easier to keep track!). 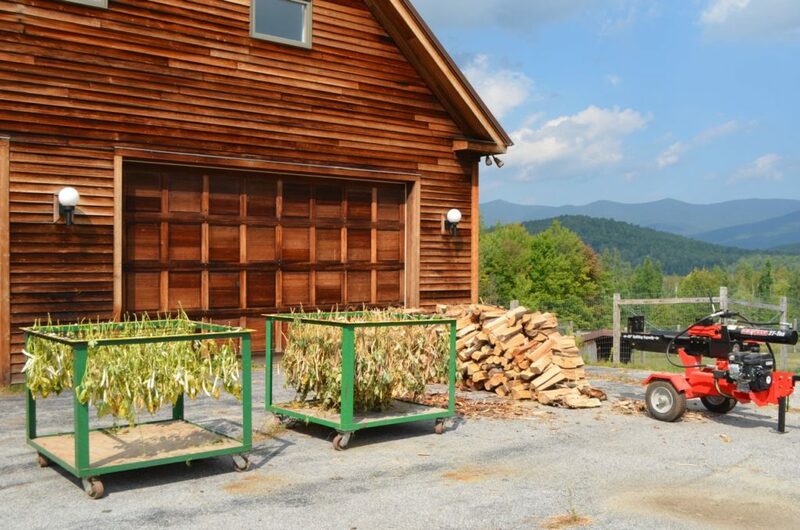 We have many more bean plants drying in a room in the back of the barn, so I know two people who are going to spend some winter nights shelling beans in front of the wood stove! She was no doubt thinking, “Hmm, I’d like to have one of these for dinner tonight.” Except she wasn’t thinking about eating an individual potato but the entire basket. That’s my girl. Alayne’s already put up 40 quarts of green beans in the freezer and dehydrated tray upon tray of zucchinis. (Yes, we enjoy them fresh, too, along with corn and other vegetables.) To add to the bounty, she brought in three bushels of apples this weekend. We still have winter squash, carrots and, weather permitting, one bed of Black Coco dry beans?yet to harvest. 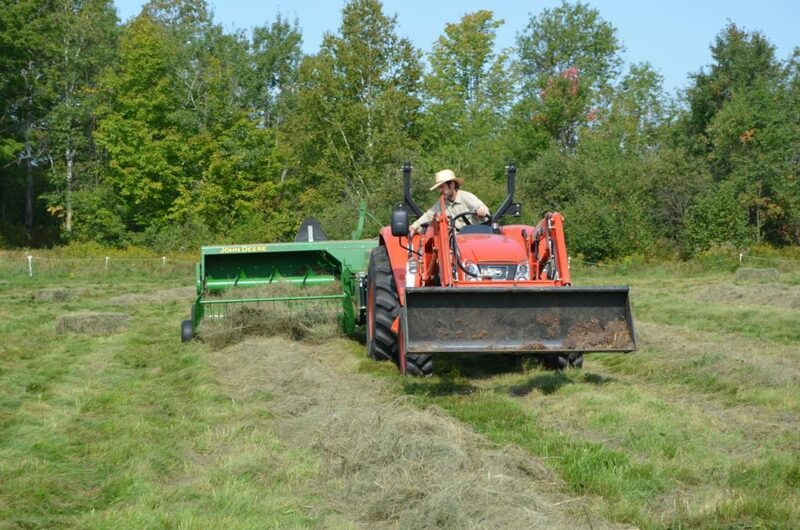 But the haying equipment is parked in the barn until next summer! Wow, that’s a lot of veggies. Lucky you. Where do you keep the potatoes and how long do they last? Also, making zucchini bread from some of those zucchini and freezing that is a good way to use them, also. Barb, we store the potatoes in the root cellar in the basement. We were still eating last year’s potatoes this July – the Yukon Golds were the best keeper. Amazing all the work you did. Congrats on a good season. You guys are amazing!! I’m exhausted just reading about all you have to do, but a bit envious of all the fresh produce! Praying you guys stay healthy and strong to continue to do all there is to do. Do the horses get any of the carrots? A lot of work, and a lot produced! I love seeing all the pictures. Tires me out…… Hope you get a minute to enjoy the bounty and relax! That’s a gorgeous harvest! Thank you for posting the photos. The onions are beautiful – – what kind(s) are they? Your readers know you folks work hard all year, but this provides an even bigger picture of the toil involved in keeping RDF running. You two are admirable! 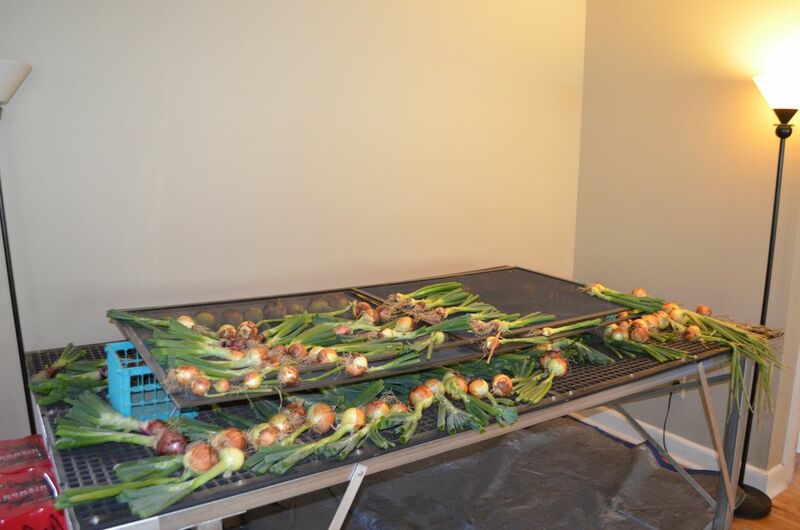 The onions are Dakota Tears and New York Early, with a few Rossa di Milano – a red variety that didn’t do well. OK, that’s totally awesome. I read up on root cellars. It certainly makes sense since they’re been around before refrigeration. One last question – did you build it yourself in the cellar or was it already there when you bought the property? Either way, you are really lucky to have it. Barb, we built it … just closed in one corner of the basement that already had small windows at the top of each wall, and that became the source for ventilation and cooling. That’s an impressive amount of produce (and hay). Farming is hard work, especially in the summer when everything seems to need to be done at once. I’m glad you had such a good harvest. 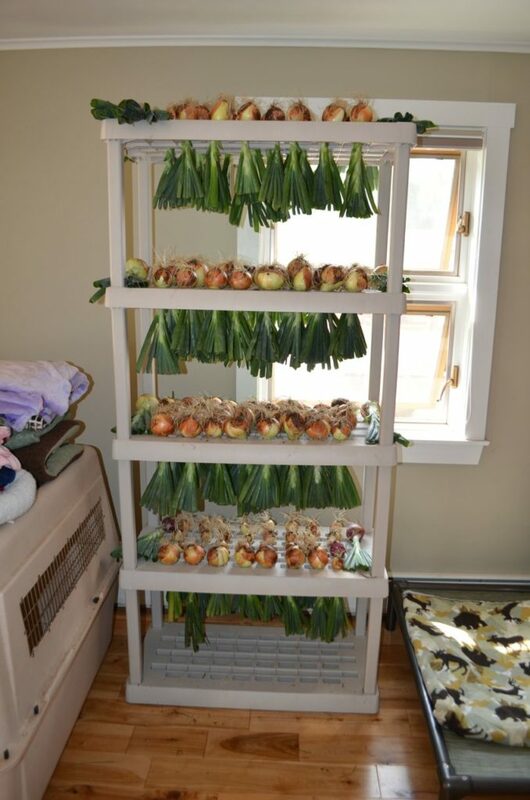 The onion tower is ingenious. I have that same set of snap-together shelves (several sets, in fact), but I never thought of using them like that. 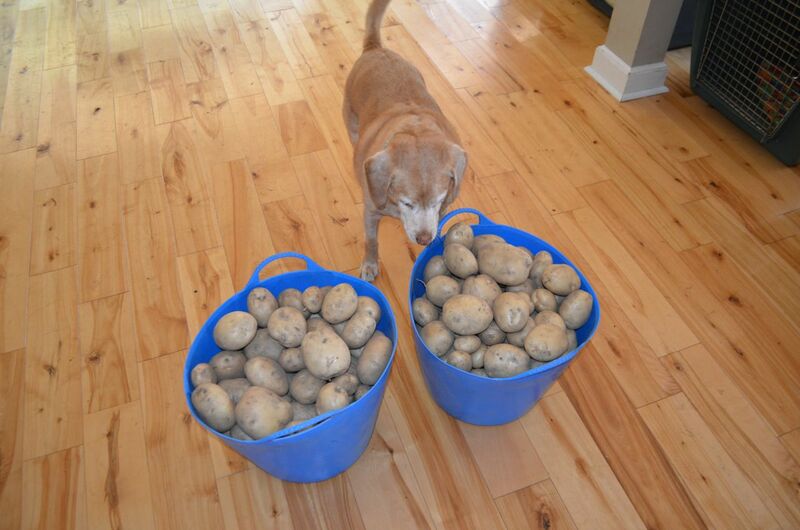 Good to see Darla doing quality control on the potatoes! What a wonderful full life. 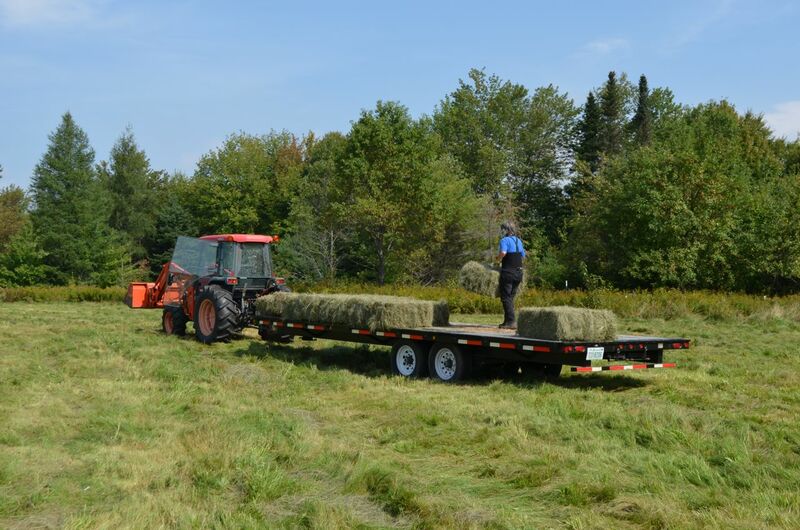 Wondering with all the haying you do, do you have to buy hay somewhere before the grass starts to grow next spring? So, how many bales do you store up from your hard work? Here in WA, those bales weigh somewhere between 60 and 80 lbs. Glad to see Alayne in a back brace. Diane, we still have to buy some hay for the horses. Alayne and I put up 910 bales total this summer. They weigh around 40 pounds each on average. Wow, 910 X 40 lbs. = 36.4K!!! I can clearly see you two are NOT in need of a gym membership. But it’s way more fun getting your workout this way, and the satisfaction of seeing those 910 bales all tucked away for the winter. Impressive…..to say the least. Wow and double Wow. What a great crop! In Florida we don’t have root cellars, or any cellars for that matter because the water table is very high, so Darla and I would have to eat those Taters quick. In the heat we’ve had, we could just set them out in the sun and bake them! You two are like the Energizer Bunny on steroids !!!! You truly are farmers and animal rescuers !! SO MUCH ADMIRATION!!! GREAT photos!!! You folis work hard. Accomplish an impressive amount of goodies to last til next year. My aunt in Wisconsin had a root cellar right under the floor in her kitchen. When I was kid, I would love to go down there with her. See what she had put up. We only saw her at summer vacation time. We’d for the catfish fishing. She had cabin across the street from her cottage on the Wisconsin River. I forget where… this was almost 60 years ago. She served up some great catfish dinners!!! it’s been a few months , since I have come around, but you’ve been in my thoughts often. Looking forward to reading what your critters are up to. Loved Jake in the hole. That is a funny photo. So glad you share them and your stories. Also, do you send out your blog to interested folks? If so, I’d appreciate being added to your list. Thank you. Am off to catch up on your animals. Have a beautiful autumn. Hugs.